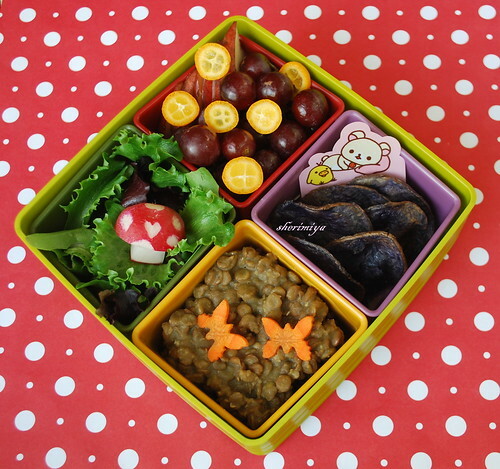 Lentil Curry Bento, originally uploaded by sherimiya ♥. Starting the week with the 4-square 4-color bento box! Here's a little historical tidbit: Many moons ago, when hapabento and I were just young'uns, we each had a round bento box. We also had other boxes, but we noticed something interesting. Whenever we used the round box, the bento looked beautiful. Even when we were tired that day and only had leftovers, somehow the food you threw in the round box became a lovely bento. Try it, you'll see. Amazing, right? So, this box was christened The Magic Round Box. Its status remained until the appearance of hapabento's 4 Square Box. I was skeptical at first, but then I got one, and lo, it's true. I mean, look at it -- it's got 4 boxes within another box, all perfect stylized squares of varying colors. You can color-coordinate or not, mix and match flavors or textures, use a theme, the options are seemingly endless. Very cool, right? And so, the Magic 4 Square Box was born! Anyway, back to today's bento: MisterMan got lentil curry over rice with carrot butterflies, purple potato chips, spring greens salad with peppadews and radish mushroom, and fruit box with grapes, red pear and sliced kumquats. I love the detailing here. The butterfly carrots are great!! Hi Lia, thanks a lot! You never cease to amaze me. Just your description had my mouth watering. I've been trying to find one of these bentos but no luck yet. I love the tiny heart, so sweet. Thanks Susan! I thought it would be too big, but it's actually easy to fill up. i love love LOVE the radish with the heart shaped spot. the cutest thing i've ever seen, really. the rilakkuma (?) baran is cute too. It's a fun bento; my boy calls it "fancy!!" i like lentils but somehow never got to cooking them myself. love the details and its a nice box to have bits of everything, colourful too. I rarely think of lentils either, and then I realize they're so quick that I should do them more often. I got a little misty eyed thinking about my poor neglected MRB! *sniff* But your awesome M4SB cheered me right back up! Woot! So colorful and delish looking. Don't worry, we see your lovely MRB every day on your avatar and atop your blog! But this one does give it some competition, eh? Thanks! The radish with heart spots is so adorable!!! What a fantastic idea!